This entry was posted on September 19, 2018 at 12:11 AM and is filed under the ugly. You can follow any responses to this entry through the RSS 2.0 feed. You can leave a response, or trackback from your own site. Love Sriram Raghavan as a filmmaker. I even liked Agent Vinod and was surprised why it didn’t do well with the public or critics. Johnny Gaddar to be is the finest piece of noir Hindi filmmaking in recent times. Yes it paid obvious homage to Parwana but cannot be called a rip-off if that! He’s referring to the 1963 French film Symphonie pour un massacre. Raghavan claims to have not seen the film, but admits JG “has a lot to do with the book on which the film is based…”. the piano tuner.. french short film.. Yes, just watched the short film.. looks like an obvious inspiration but even looking at Andhadhun’s trailer one can say the story of the short film appears to constitute only the initial hour of Andhadhun. To be fair to Raghavan he seems to have build up a story from where the other film left off. I really liked the trailer, and am glad to see Ayushmaan Khurana in something other than a light comic role; and heck I’d watch anything with Tabu’s sultry self. Badlapur was a bit of a let-down from Raghavan (perhaps it never could get over the bizarro casting of Varun Dhawan) but I’ve really liked all his other films, although none have been as complete and perfect as the gem Johnny Gaddar was (Ek Haseena Thee had a brilliant first half though, one of Saif’s best roles). In a recent interview to The Hindu, filmmaker Sriram Raghavan talked about how a long sequence in the first half of Andhadhun is the reason why he made the entire film. Without revealing anything about the seven to eight-minute long scene, I would say that when it comes to Hindi cinema, it is one of the most exquisitely crafted and perfectly realised situations on screen. A gourmet cinema spread, if one can be allowed the similitude. The elaborately scripted details, down to the tiniest of props, expressions and movements; the fabulous, at times Chaplinesque interplay of actors; the play with camera in the defined space; the sharp editing; all set to Amit Trivedi’s lovely four-minute 19-second long piano-based theme. All in all it’s riveting. 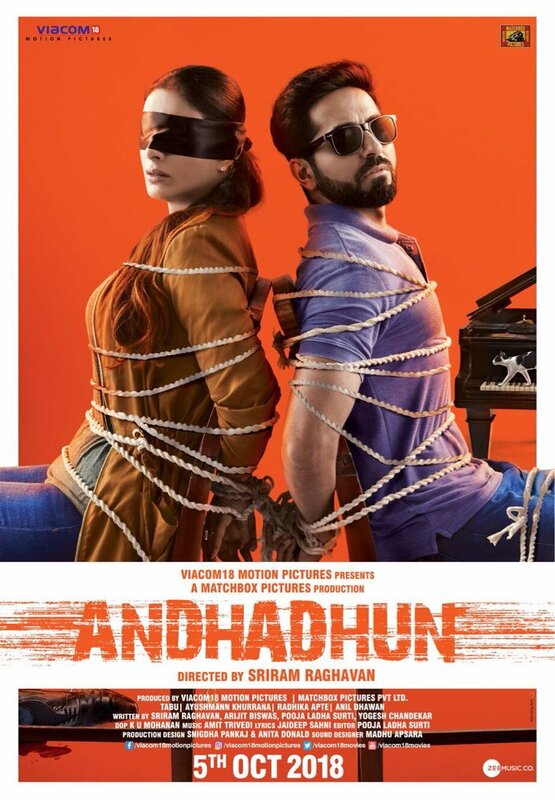 Andhadhun was terrific fun: a slickly plotted thriller and a dark, dry comedy; two things that Hindi cinema usually never manages to get right. Sriram Raghavan proves yet again that he is a wonderfully gifted stylist and adept at using nostalgia in a way that doesn’t feel too derivative or cheesy. The blind pianist sequence from Agent Vinod is resurrected here and becomes the movie’s most spellbinding scene. Tabu absolutely stole the show and really sunk her teeth into the pulpy, diabolical femme fatale character. It’s a real shame that she’s no longer considered mainstream heroine material because she’s so compulsively watchable and such a skilled actress. Anil Dhawan as her yesteryear actor husband was an inspired casing choice. Ayushman was reliably good but I don’t understand the hyperbolic praise being heaped on him considering that this was Tabu’s film all the way. Ayushman did okay in role but he has tendency to pick right ones which apparently most of the actors lack. As I commented, movie is very well made. Reminds of Tarantino’s movies. But as audience, I most likely forget about the movie in sometime. Neither of Ayushman’s movies are showing at my theatre but Namaste England has 4 shows. That’s pretty sick whoever played that joke on me. Interesting article Munna! I will agree that it’s a well made genre film but I wouldn’t be this impressed by it if it were a Hollywood or European movie. As I mentioned in my earlier comment, Bollywood rarely does either smart, stylish thrillers or good black comedies so part of the appeal is the novelty. However, I’ve grown up with Tamil and Malayalam cinema and I can’t think of any directors there who are similar to Sriram Raghavan. There are some talented Tamil noir filmmakers but their work is marked by violence and gore and usually features a very intensely male gaze and a very male-dominated environment; for me, their work is nowhere near as enjoyable or relatable as Sriram Raghavan’s cinematic mileau. In article, I agree with sentiments regarding Bollywood given too much importance and there are good movies in regional languages. I have said on blog that only movie in past some years nominated to Oscar, with better chance was Visaranai or Mohan Lal’s Drishyam was much better than Hindi Drishyam. We have already seen Baahubali. But criticism of Andhadhun doesn’t fit that bill. This is one movie, I can ask my colleagues from other countries to watch it without any fear of question..what was that. Saw the Andhadhun @Netflix . The movie was really engrossing and for once I did not mind the confusing ending. Tabu, Ayushman and Zakir Hussain were brilliant. I did not like any of the original songs ( I think the voice also did not suit Ayushman) , however loved the use of old songs at various places. BR’s review is totally spot on. Sriram: One title was Khuli Nazar, from a song in Manmohan Desai’s Parvarish. Some of the proposed titles were Mud Mud Ke Na Dekh, which is on the back of the auto rickshaw we see in the film. But 99 per cent of the people we spoke to didn’t know the reference to the song from Shree 420. Also, The Artist. Saaz aur Saazish, which would have sounded very 1970s. Aankhon Aankhon Mein. One more title was Black and White. Ayushmann’s suggestion was C Sharp. Pooja: There was Harkat, which also worked as a musical title. And, Andha Hai Kya! and Kala Chashma. During his happier moments, Sriram would suggest Maa Ki Aankh.Aao Twist Karein was nice too. Also, Ae Bhai Zara Dekh Ke Chalo. Andha Dhund was also apt, but then we decided to pun on the words. Of course, we were told, it should be Andhidhun since dhun is feminine in Hindi. But what is a pun with grammar? One of the theories I read was that Ayushmann never lost his eyesight in the second half. SR: No, that’s not possible. The other theory is that the rabbit didn’t exist. The fact that there was a rabbit on his walking stick meant he was using it to make up a story. PS: But we didn’t want The Usual Suspects end where you are very sure that he conned the policeman. But yes, this theory that he could be making that last bit up is possible. He must have lied to Radhika Apte’s character Sophie about what could have happened. SR: If I was watching the movie objectively, I would think Ayushmann’s taken Tabu’s eyes. And what if the rabbit did exist? How would you explain that? Because if he’s blind how does he know this rabbit hit the car and that’s how Tabu dies? SR: Someone must have told him that the accident has happened. Maybe the guy shooting the rabbit came and told him that ‘ek khargosh tha aur usne tumhain bacha liya’. This probably happened at the time he is standing on the highway and the car is burning. Maybe after some time a bus came and people helped him. So he’s still blind. In fact, Pooja had another ending she should narrate. Movie is so abstract and cunning in this way. Loved this aspect.